Compared to the guitar, mandolin chords are EASY. In fact, most mandolin chords only use two fingers or sometimes only one. In the mandolin chord charts below, each horrizontal line represents a pair of mandolin strings. The E string is the one closest to the floor, as you hold your mandolin in playing position, and the G string is closest to the ceiling. The numbers represent the fret. Be sure to place your fingers between, not on, the fret. The letter to the left of each chord chart tells you the name of that chord. The letters on the strings tell you the name of the note where you put your fingers. Each chord chart also tells you what fingers to use. An “X” means you don’t play that string. When you’re making a chord, it’s essestial that you go to the chord with both fingers landing on the strings at exactly the same time. In the key of G, for example, you’ll normally need these three chords: G, C, D.
In the key of D, you’ll need D, G and A. 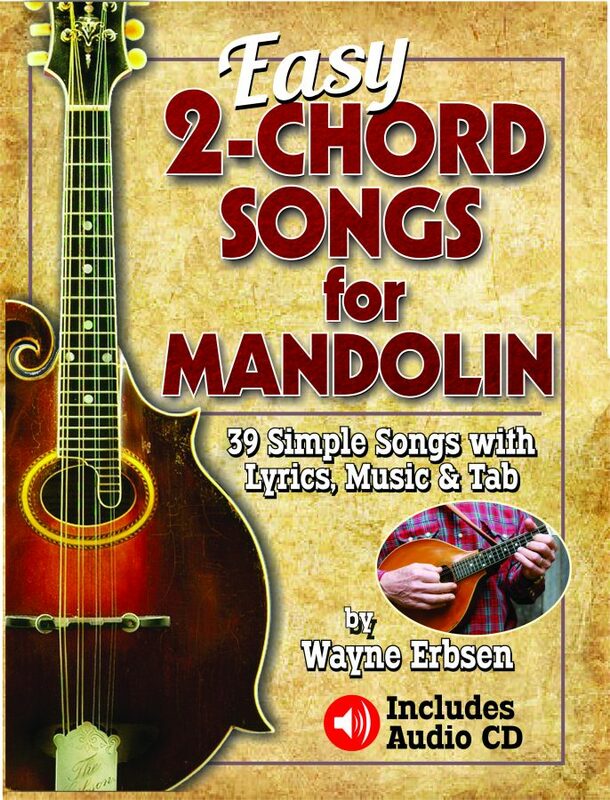 And in the key of C, you’ll need C, F and G.
HOT OFF THE PRESS- Easy 2-Chord Songs for Mandolin. It doesn’t get any easier than this, folks, as all the songs have only TWO CHORDS. Learn easy chord rhythms, simple melodies to classic bluegrass, gospel and folk songs, as well as lyrics, history, and vintage photos. Spiral bound and comes with a CD. 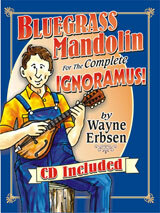 Bluegrass Mandolin for the Complete Ignoramus! will be your new best friend. Its friendly style and easy songs makes learning the mandolin fun and nearly painless. It comes as a set with a CD with 90 tracks where I play each melody very slowly and clearly on the mandolin. 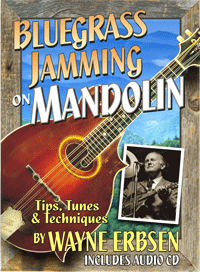 Bluegrass Jamming on Mandolin, is now available! This book covers how to play with others, how to improvise, how to add licks and fills, and pretty much everything you’ll need to march confidently into your next jam or picking session. You’ll love it, guaranteed. arthritis has really taken a toll on my hands. Without two finger play and instruction I would have to give up playing. How can I play a F chord on the mandolin instead of the three figure? What does it mean to cord in open position? It means that your not playing a barre chord, which is where you “bar” the frets with youre index finger, kinda like a capo. You can find most of these on page 93 of our newest book, Easy 2-Chords Songs for Mandolin. If you are ever stuck not knowing a chord, you can figure it out for yourself, too! These chords are all made up of three notes: the 1, 3 and 5 of a scale. If you know your scales, you can figure out what notes belong in each chord by choosing the 1st, 3rd and 5th notes of each scale (so for a ‘A’ chord, do this for the ‘A’ scale’). You can then figure out where you can find those notes on your mandolin’s fingerboard. There are different combinations of notes you can use, and this is why there is more than one way to make each chord.